John (Arya) and Regina (Nayantara) get into wedlock against their wishes. Their life after that forms the rest of Atlee’s directorial debut Raja Rani produced by A R Murugadoss in association with Fox Star Studio. Further it also deals with the relationship that between John and Keerthana (Nazriya Nazim); Regina and Surya (Jai). What makes John and Regina marry each other; do they fall in love with each other or did their worlds fall apart is nicely narrated. The screenplay is swift and there is not a moment that bores you. The cinematography is soothing to eyes. The story per se is free from clichés though the climax is predictable. It oozes with positivity. The costumes of all actors are done beautifully. The background music blends with the narrative. The songs could have been much better. However, I loved the track sung by Gana Bala and its choreography. Arya as John is charming. His transformation from an irate husband to someone who yearns for his wife’s attention is amazing. Further, the scenes with Nazriya as Keerthana oozes with the innocence that only first love could have. He is charming as always. Nayanthara as Regina is independent and bold. Yet she portrays the dilemma that most of today’s generation carries in their hearts. Her discomfort with her husband and her boundless love for Surya is beautifully enacted. She looks fabulous both in the scenes with Jai and Arya. Jai as Surya, a young innocent man steals our hearts. He carries the kind of charm that he had cast in Engayum Eppodhum. Nazriya Nazim as Keerthana is bubbly. Her mannerisms reminded me of Genelia D’Souza. She is cute. Her Tamil carries Malayalam accent which makes it cuter. Sathyaraj as James, Regina’s cool dad steals our hearts. He is a very progressive thinking father who never leaves the side of his daughter yet subtly forces her into a better life – a kind of life that she always dreamt of. I bet that every girl would either relate his character to her own father or wish that they had one like him! Santhanam as Sarathy, John’s childhood friend, cracks jokes with impeccable timing. Comedy blends with the plot easily; therefore, the fun reaches another level altogether. There are many laugh-aloud-moments. Santhanam also has many intense scenes. He comes across as that friend who pats his friend when he does something good, stands by during bad times and slaps hard when he does something bad/foolish. As always Santhanam rocks! All the supporting actors have enacted their parts convincingly. The director has given adequate care to details. For example, when the narration takes us to the Year 2007, John rides Yamaha RX100 and comes across with an ear stud, a craze at that time. Unlike boys, girls mostly will not have same set of friends all their lives. Hence, her friend during college days is different from the one she has later in life. Whereas John has only Sarathy! However, it seemed like the director was forced to reach to the climax with an abrupt ending. But, we can’t blame either because he had to convincingly narrate three love stories. The scenes involving John and Regina’s neighbor with another woman and Sarathy’s uncle with another woman could have been avoided because it ridiculously fits in such a charming script. That slot could have been bought for slowly reaching to the climax thereby adding little moments between the leads! In any case, the movie is a delight. It is not preachy yet it conveys a strong message. I bet that its optimism will hit you as a fresh breeze of air! Go for the movie and enjoy the show... It is worth every penny and the time you spend! 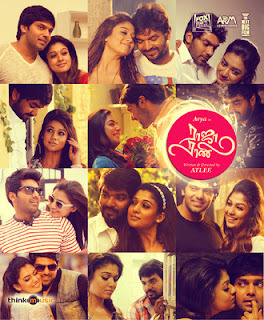 This Raja Rani will not fail conquer our hearts! One small observation to your view that adequate care has been taken for narration of events in 2007 and Director has keen eye for details. I feel you failed to notice one scene...See in Nazria's introduction she is seen as dancing to the song ringa ringa ringa re....( Telugu Song from Arya - 2). And I love the song so much that I dont remember when it released!